This summer, I tried Kool-Aid dyeing again as part of my Monthly Adventures swap. I had a fabulous time with this one. The exchange involved dyeing a skein of yarn to match your partner's preference in both yarn weight and colors. My exchange partner's request was for sock yarn and her suggestion for the colors was "a field of tulips". I decided that the perfect tulip colors would be yellow, orange, and red. I also needed green for the stems. It was a bit difficult to find the green - only one out of 4 grocery chains happened to have the green Kool-Aid in stock! Soak the sock blank in warm water while preparing the dyes. I then took the green dye and "spooned it" onto the "canvas". I gently pressed the dyed area with the spoon to make sure the dye soaked through to the back. Next I applied the orange dye. Finally I applied the red dye. I then went back and "filled in" all the blank spots with yellow. I also flipped it over and applied dye to try to ensure that all parts of the "canvas" were dyed. Then I finished it off by wrapping it in plastic and microwaving it for two minutes, letting it stand for two minutes, and then microwaving it again for 2 minutes. I was quite pleased with how it turned out! 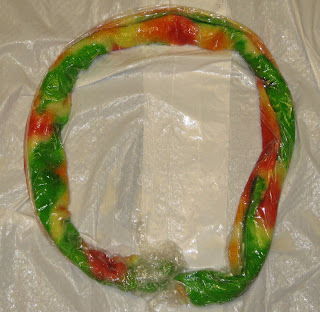 Kool-Aid dyeing is definitely a great way to try your hand at dyeing. The only "down side" is that the colors are not lightfast. I finally have special pots - specifically for dyeing - so I can now move on to other types of dyeing as well. Tonight, I got a very pleasant surprise as I sifted through the contents of my knitting bag. I had gone to my friend Paula's house last Friday (with knitting in tow...of course) for "Rhodapalooza" - where we watched the first season of "Rhoda" (loved it!). 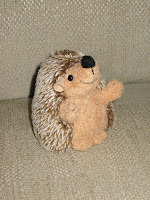 Paula had an adorable little stuffed hedge hog that "kept me company" on the footstool while we watched the shows. "Somehow", the little hedgehog found his way into my knitting bag and hitchhiked a ride back to my house. (He remained hidden for several days as I hadn't really dug around in my knitting bag until tonight.) He's so cute! I've named him "Mr. Frosty" because of the white "frost" that's embellishing his outer coat. Thanks Paula! That was a wonderful surprise! 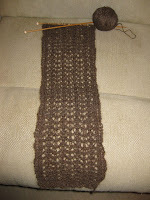 I have made significant progress with my ultra long "Magic Arrow Lace Scarf" out of the Suri Alpaca. 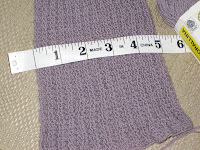 It's 52" long now.....I'm not sure how long I'll really make it - I don't want it to be too long! Mom had said the scarf was beautiful and even had beading on the end. Well, the pattern somehow neglects to tell you how to do the beading, what size/number of beads you'd need, or even what the beading looks like! Unbelievable! All the pattern says is "You can add the optional bead edging". Harumph! Guess I'll start flipping through some patterns and pattern books to see what sort of beaded edging would complement this scarf! The other thing I'm worried about is the amount of yarn. I seem to be about half way through the first skein....and the scarf only takes two. I'm a bit worried that the scarf might actually be more of an ascot than a full fledged scarf. Perhaps the cast on of 51 stitches on a US size 3 was incorrect as well? 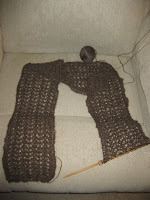 I'll re-assess once I'm done with the first skein - I may decide to tear it out and re-do it as a thinner scarf. I managed to get some spinning in as well. 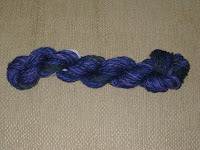 Here's the hank of hand spun that I crafted from the Merino fiber Elizabeth gave me a couple of weeks ago. As I spun, I tried to make some parts more purple than others for variety and depth. 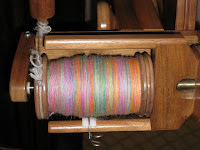 I then Navajo plied without regard to the colors so I got a very marbled and barber poled blend. I also somehow managed to pick up some of the green singles that were already on the bobbin, so the beginning of my hand has a blue-green tint whereas the remainder sticks to the blue and purple colorway. I really like how the green looks, so I just may leave it in as a design element - I love how it turned out! Now, I just need a suitable project for this. Perhaps a lace project of some sort??? 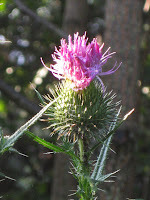 On my dog walk, I discovered that my favorite thistles were now in bloom. I love them because their tossled tops of "hair" remind me of Beaker from "Sesame Street". And they're purple too! I also found a bush like tree that had very interesting "seed bundles". 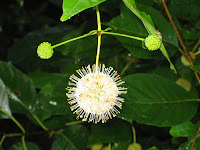 It's a perfect sphere of seeds similar to the dandelion, but less fuzzy. I have no idea what it is, but I was intrigued by these perfect orbs (click on the photo for a closer look). This particular grouping reminds me of the molecular model kits that both my sister and daughter have "played with". 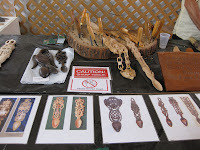 American Folklife Festival - Hand Carved "Love Spoons"
The hand carved wooden spoons were awesome! They're definitely works of art. The craftsmanship and love that goes into each piece is amazing. The variety of symbols and the detail on each spoon is amazing! 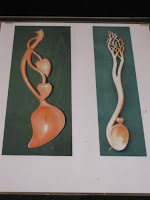 I was fascinated by both the process of creating the spoon and the significance of each design. 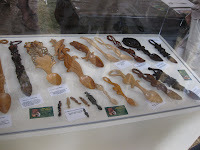 The tradition of giving a hand carved spoon wasn't limited to Wales, but with the strong Celtic traditions that still reside there, they've become one of the best known groups of carvers. 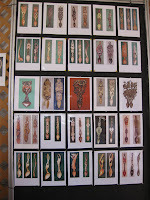 The photos on the walls (in addition to the spoons shown above) show the immense variety of spoons - from the simple to the elaborate. These are a couple of my favorite spoons. They were not the most ornate, but they were certainly exquisite! I think that the elegant simplicity is what appealed to me the most. The branches on the spoon on the right were just beautiful - I can almost picture the tree it was carved from! 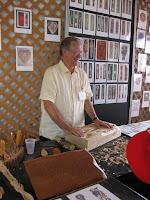 Any woodworkers out there? I found a fabulous tutorial on how to make these spoons yourself....if you're so inclined. They even have included some free patterns to get you started. The process is fascinating! The 10 page "Welsh Love Spoons Tutorial" will step you through the process so you can make your own love spoon! How cool is that? 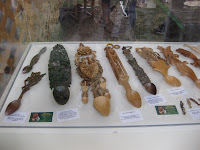 In addition to the smaller carvings, the Welsh woodwork extended to larger pieces as well. 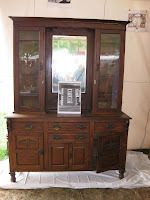 I just loved this dining room hutch. Just imagine the family china and crystal elegantly displayed in this exquisite piece! 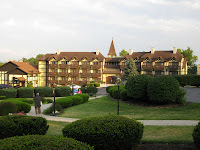 We stayed at the Bavarian Inn in one of the rooms in the Chalets (not in the huge main building) that overlooks the Potomac River - it was gorgeous! The rooms in the chalets are huge and have great views as well as a fireplace and whirlpool bath. Definitely a great environment to kick back and relax! This was the view from our room - to the left and to the right. It was wonderful! 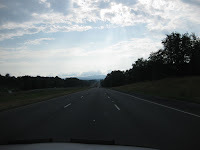 I loved seeing the mountains off in the distance! 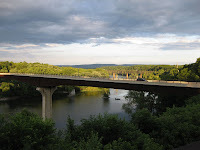 The river just beneath our room is the Potomac and separates West Virginia from Maryland. 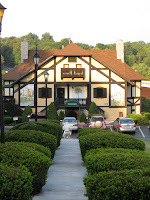 The food at the Bavarian Inn is always absolutely wonderful! On Friday night, DH had the antelope and I had the duck. Of course, I had to try a taste of the antelope since I'd never had it before. It was very good and had a rather subtle and delicate flavor. The appetizer I chose was fabulous - "Seafood Tasting “Three Ways”: Smoked Salmon with Citrus Crème Fraiche, Smoked Trout over Corn and Truffle Pudding, & Seared Scallop with Melon and Mint Salsa". It was out of this world! The blend of flavors was absolutely divine! Of course, you have to like fish to like this appetizer! On Saturday, I had the pheasant wrapped in applewood smoked bacon. It too was absolutely delicious! The town is very cute - lots of restaurants and interesting little shops. There's a nice variety of shops for a small town, though I was a bit disappointed that one of my favorites is no longer around. 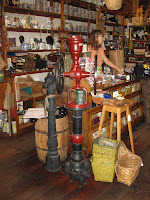 Originally, there was a pharmacy in town with a classic soda fountain - it was a favorite pit stop of ours. 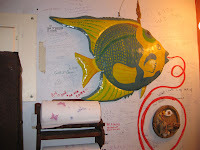 However, it went out of business several years ago and a restaurant moved in....preserving the soda fountain and offering some of the same fare. Sadly, it too was gone. We had to do without the handmade malteds and egg creams - sigh. 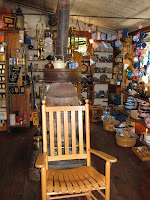 Thankfully, one of my other favorites was still there - O'Hurley's General Store. It has everything you would need....from food prep through hardware. I spent quite a bit of time in there - there was so much to see! I even managed to pick up a book on Aran Knitting! Don't you just love all the packed shelves and the fancy cash register? Check out all the kitchen needs on the right....everything you'd need to set up your modern kitchen! I'm a particular fan of speckle ware and cast iron pans...and they had quite a variety to choose from! 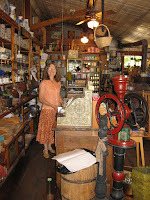 I loved the big red coffee grinder....definitely sized for the "serious coffee drinker"! 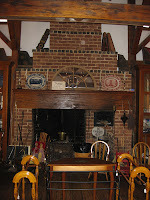 The fireplace in the back room was fabulous. 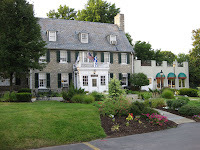 The proprietor (Captain Hurley) said it's really spectacular in the winter with a roaring fire and hot apple cider being served. 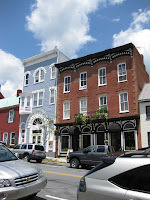 I love the architecture or many of the buildings around the town as well. 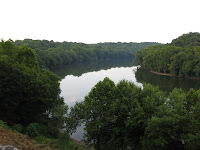 It's definitely a great place to go for a break from the normal hustle and bustle of the DC area! 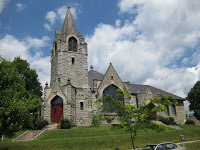 The church is the "New" St. Peter's Lutheran Church - it was built in 1906. The church itself originated in 1765 and was a log church! 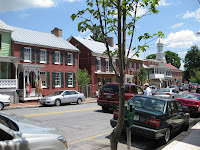 On the right is a typical view of German St. - its a wonderful mix of shops and homes. The only thing missing is a yarn shop! 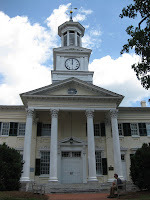 These are a couple of views of the Shepherd University Clock Tower - I love the architecture! 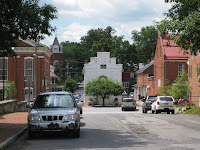 The little white building in the middle of the photo is the Shepherdstown Public Library. 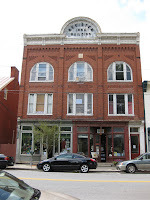 The library has been housed in the "Old Market House" since 1922. 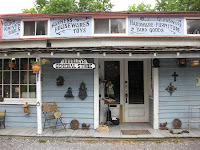 It's a little building with lots of character. Just behind the library, they have a farmer's market on Sundays. Somehow this seems appropriate since the building was originally built in 1800 as the market. 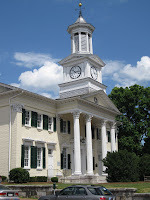 The second floor was added on in 1845. I did find some interesting "modern" additions to the town. The bathroom wall in the coffee shop was full of opinions and advice and made an interesting read. Many of the writings seemed to focus on religious beliefs - the existence or non-existence of God. 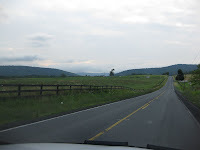 Others simply expressed their opinions about their many and varied experiences in life. It was definitely an eclectic collection of opinions and ideas. I did manage to get a bit of spinning in while I was there - after all, you have to relax after a hard day of shopping! I finally finished the Corriedale I got in one of the "Monthly Adventures" swaps. It was hand-dyed by Naomi from the UK. She does beautiful dyeing! 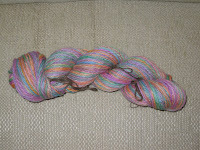 I decided to Navajo ply singles so I could best preserve the lovely colors. 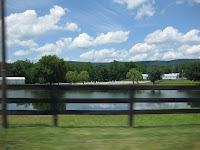 The weather was absolutely perfect the entire weekend - low humidity with the mid 80's for the temp - definitely not the typical hot/humid weather we've come to expect this time of year. It was absolutely perfect! 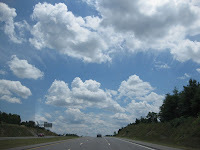 The sky was a vibrant blue filled with fluffy white clouds that provided a spectacular view throughout the entire drive home! (double click on the photos for a closer view). Mmmmm.....who says you have to have the "same old thing" all the time? I love salads, but sometimes, I just want something a little different to accompany my meal. Monday night, I decided to make salad, but with a bit of a twist. I was quite pleased with the result - it was very colorful, refreshing, and summery! 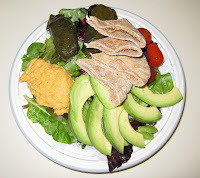 There were a couple of Dolmas, a spoonful of roasted red pepper hummus, half an avocado (sliced), a handful of grape tomatoes, and a few wedges of pita bread all resting atop some mixed baby greens. Delicious! It's definitely a departure from the usual side salad! I've been continuing to work on the Magic Arrow Lace Scarf and it's finally beginning to look like a real project! 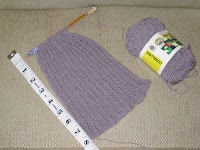 I managed to successfully knit several rows on Tuesday and Wednesday. It seems I've finally turned the corner on the "yarn splitting" problem - I'm much more aware of what my needles are doing and can avoid splitting the yarn for the most part. When I do split it, I'm catching it right away, so I haven't had to tear back for repairs. However, all is not quite golden. As I've increased my skill at avoiding "the splits", I seem to have relaxed a bit and I've found another way to mess up. Row 1 starts with k1 tbl followed by k3 and a yo. I somehow fixate on the k3 and end up knitting a total of 3 stitches instead of 4 - essentially, I'm doing k1 tbl followed by a k2 and a yo. It's getting better though....instead of catching my error during row 2 of the pattern, I'm catching it in the offending row. I still have to tear back a few stitches, but it's not too bad. I'm also starting to double check my row 1 after the first 5 or 6 stitches. This is an easy lace pattern, so I don't know why it's giving me such fits! My step-daughter (SD) came up for a visit this past weekend - kind of a combined Mother's Day, Father's Day, and Birthday visit. (Obviously, we like to drag our holidays out! It's much more fun that way!) She gave me a gift card to JoAnn Fabrics - wahoo! I always find stuff on line from there that I "need" - LOL! As it turns out, my SD is quite the carpenter! 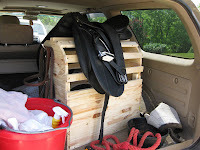 She didn't have a saddle rack for her SUV, so she built one herself. It's awesome! I'm very proud of her. 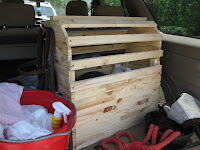 It's even got a storage bin in the bottom for some of the tack and other "horse needs". Pretty cool, eh? Your rainbow is intensely shaded violet, pink, and yellow. What is says about you: You are a creative person. You appreciate optimism. You're good at getting people to like you. You are a good listener and your friends are glad to have you around in difficult times.